Home Eastmans The Wyoming Grizzly Hunt Is On! Finally! 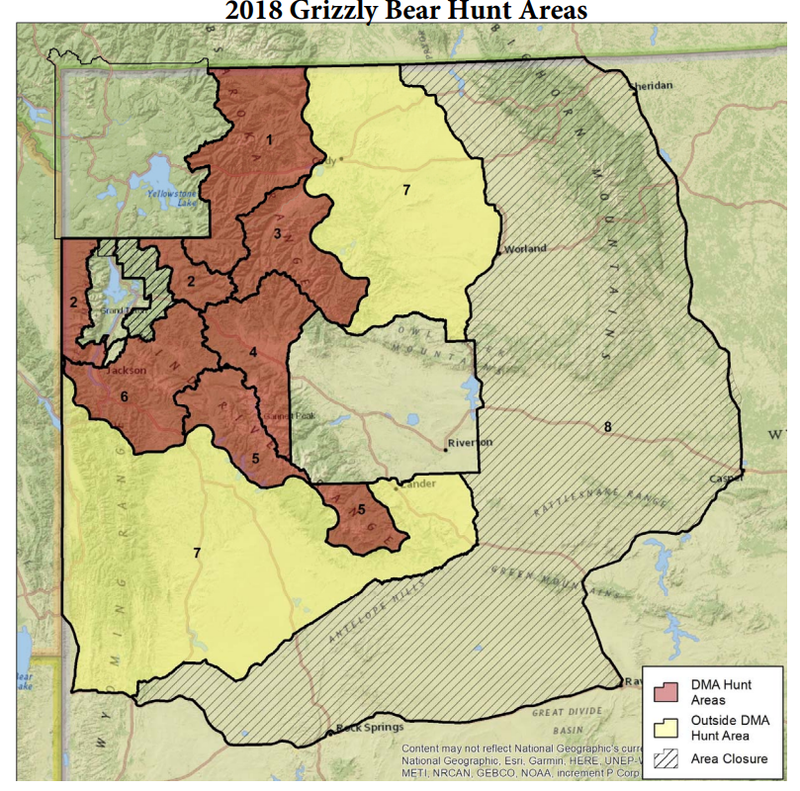 – After 44 years, Wyoming just conducted the draw for 22 grizzly licenses. According to Wyoming Game and Fish, about 7,000 applications were received for the random draw, making odds about 1 in 159, although nonresidents are limited to 25% of the licenses in Areas 1-6. Ten licenses are for Areas 1-6 that comprise the “demographic monitoring zone” (DMA) around Yellowstone National Park. The other 12 are for Area 7, an area the Department doesn’t feel is suitable for grizzlies and the bruins are causing conflict. This is a controversial hunt, and because of that, this will be the most heavily regulated hunt in the U.S.
Areas 1-6 – The Wyoming Game & Fish Dept. will contact the first 10 names in order of their random draw results and will keep calling until 10 people have responded that they want the license. They will have 10 days to get their money in – $600 for residents, $6000 for nonresidents. They will also have to give proof of a hunter safety card if they are under age 60. If the 10 days go by, it’s on to the next names. In Hunt Areas 1-6, the hunt will run Sept. 15 to Nov. 15. But, only one person will be hunting on Sept. 15. That is, one person for all six zones, not one hunter per zone. The second hunter will not hunt until the first hunter’s 10 days are up or they are successful. When a hunter is successful, they must report it within 24 hours using a WYGF-supplied device. So, this is a series of 10-day max solo hunts. The hunt will also be monitored by satellite. Kills must be at least a quarter-mile from specified highways, probably in the interest of crowd control and avoiding demonstrations. No baiting is allowed. There is a mandatory orientation and mandatory harvest check-in. In Area 7, the season runs Sept. 1 – Nov. 15 in the two separated regions that make up Area 7. Twelve licenses will be awarded to those whose names are drawn and get their money in, so the system is more normal in this area. Baiting is allowed, but only by permit and only if the Dept. thinks it is necessary to fill the quota. 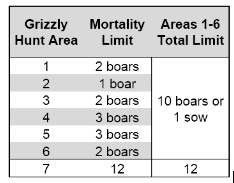 In Areas 1-6, each area has its own mortality limit. See the chart. Once it is reached, no one else can hunt that area. Here’s the big deal – if even one sow is shot in any of those areas, the hunt is immediately over for everyone with a license for Areas 1-6 whether they have filled their license or not. The sow need not have cubs. Robertson claimed 1,000 – 2,000 applications were submitted. I’m skeptical, but if so, 3-6 of the 10 licenses could be denied to lawful hunters. Since the State requires a hunter safety card and falsifying one is a crime, that may stop most activists, and the State would go on to the next person in line. A $6,000 cost for a nonresident license may deter others. But, their activity raises an important question. It is against the law to interfere with hunting in Wyoming. (i) interfere with the lawful taking of or the process of lawfully taking any wildlife. (d) Any organization or association which counsels or solicits its members or others to violate subsection (a) of this section is guilty of a misdemeanor punishable by a fine of not more than ten thousand dollars ($10,000.00). Each subsequent violation of this subsection shall be punishable by a fine of not more than fifty thousand dollars ($50,000.00). (h) As used in subsection (a) of this section, “process of lawfully taking” means travel, camping and other acts preparatory to taking wildlife if occurring on lands or water upon which the affected person may legally take the wildlife. I’m not a lawyer, but it seems to restrict the definition to interfering with activities after having drawn a tag. Wyoming residents might want to contact their representatives about adding language that expands upon what it means to interfere with the lawful taking of wildlife. Even so, all the extremists need to do is pay someone to shoot a sow and the main hunt is over. If a sow is killed, questions are sure to follow. Despite all that, for hunters that do get a tag, they will be the first in over 40 years to hunt Ursus arctos horribilis in the lower 48 states. After all the politicizing and nonsense surrounding this hunt, this is an historic accomplishment and hunters should be proud to be part of it. It’s about time. 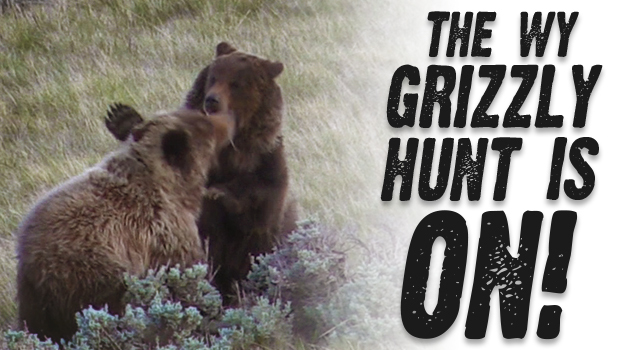 The post The Wyoming Grizzly Hunt Is On! appeared first on Eastmans’ Official Blog | Mule Deer, Antelope, Elk Hunting and Bowhunting Magazine | Eastmans’ Hunting Journals. Next articleIdaho Hunting Unit Shutdown?